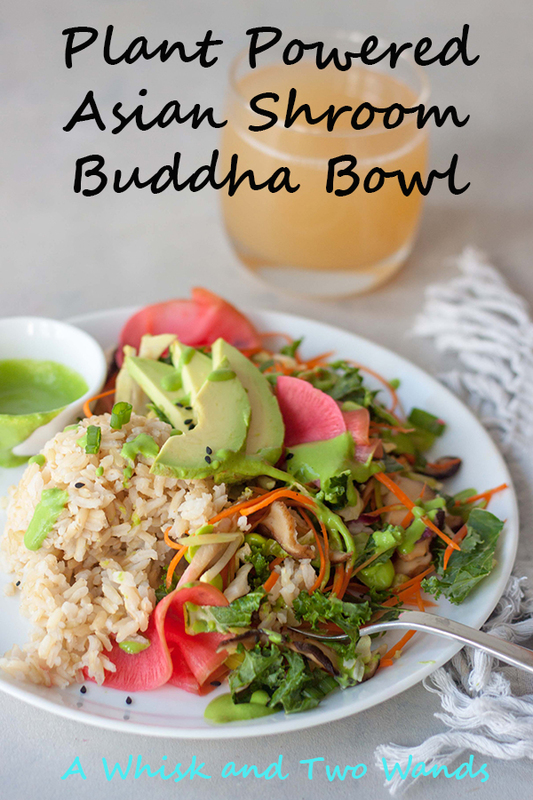 I know shared a teaser for these Plant Powdered Asian Shroom Buddha Bowls on social a week and a half ago and I’m just now sharing it, trust me though it’s worth the wait! I wanted to share it on a Meatless Monday as it’s packed with plant-based nutrition and a perfect recipe to share for the weekly Meatless Monday link up with my co-host Deborah. It wasn’t ready last Monday with everything going on with our pup and trying to get ready for Expo (more on this below) and I didn’t want to share it mid week last week. Just a heads up for my faithful readers if I ever share something on social and you want the recipe message me and if I won’t be getting it up for awhile I’ll try to get the recipe sent over if I’m able so you don’t have to wait for me to write up the post. I was really trying to get this photographed in a bowl, since it’s called a buddha bowl, and it was much harder then I expected especially given the lack of natural light and hours of light here in Minnesota during the winter. Instead of calling it a salad, stir-fry, ect and the fact that I eat it out of a big bowl I just went with the plating it pretty so you can see all the amazing colors, flavor, and texture. However it doesn’t have to be pretty to be good so I’m also sharing a picture of how it looks on a “normal” night out of a bowl. Pretty sure you’ll get the idea so I’ll save sharing a picture of me eating it out of a container on the sideline of soccer, in the car, or sitting outside gymnastics or dance for Instagram Stories, a glimpse of my “normal” day to day. 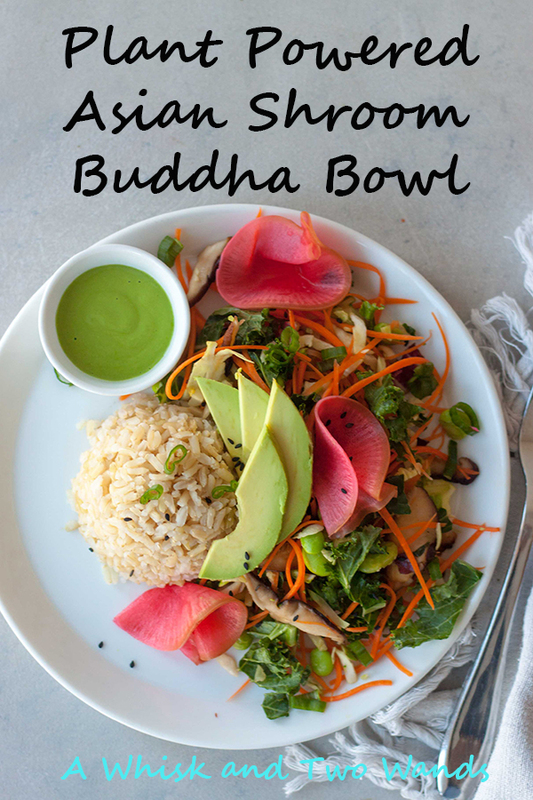 On to what you really want, the details on these pretty amazing Plant Powered Asian Shroom Buddha Bowls! An amazing plant-based café opened up here a couple weeks ago called Juice So Good Café. I had the pleasure of dining there the week before they officially opened and everything was amazing. I couldn’t stop thinking about the Spicy Asian Shroom Protein Plate my husband had ordered that I only had a bite of, yes it was that good! It opened up a week later but with our pup getting sick, which is expected at over 15 years old but we’re never really ready for, the weather, life, and the fact that it’s down town and only open weekdays until 6pm I wasn’t able to make it back down as planned but was craving that protein plate among other things. What was a girl to do other then to take matters into her own hands and try to create it at home. 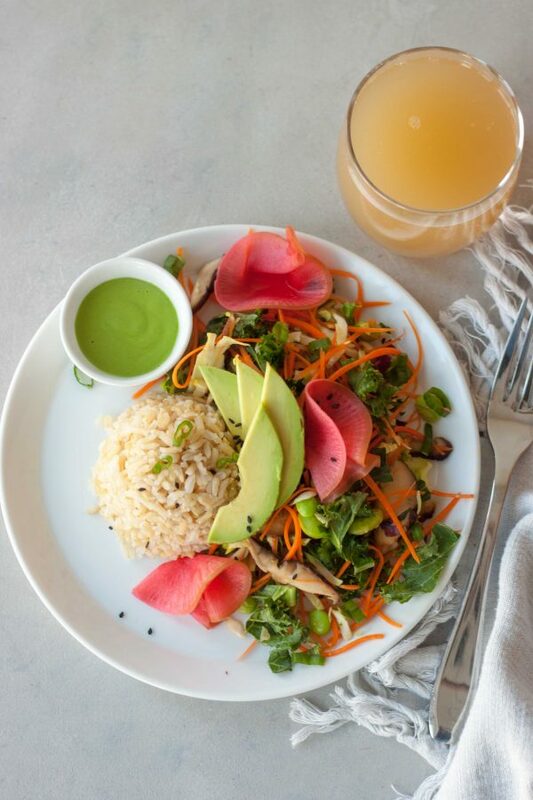 While this Plant Powered Asian Shroom Buddha Bowl isn’t an exact copy cat it’s delicious and cured the craving! This amazing bowl, or plate in this case, is packed with so much flavor, texture, color, and nutrition! 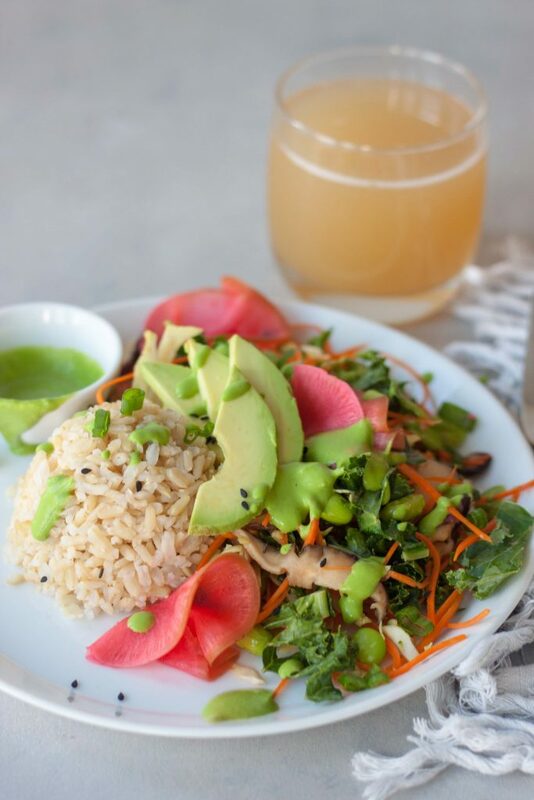 Brown rice served with sautéed mushrooms, power greens, carrots, and edamame. 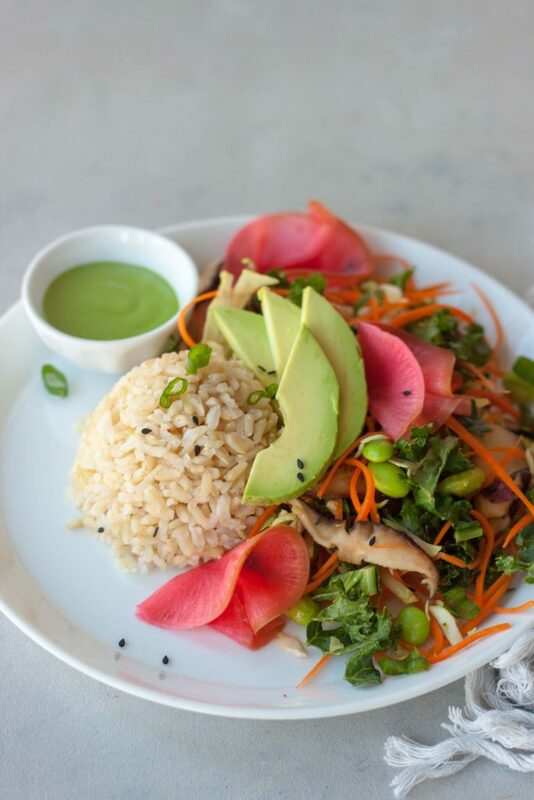 Topped with slices of avocado, pickled watermelon radish, sesame seeds, and scallions. Oh and then drizzled with a spicy horseradish dressing! The dressing was the hardest part to figure out as I know the café uses edamame and I wanted to use a creamy cashew base but also wanted to keep it simple and not have to soak cashews so I went with plain unsweetened almond milk yogurt (Kite Hill Greek Style Unsweetened)! I wanted to keep this recipe quick and easy as I knew it would be a staple I would probably want often for lunch or dinner and I’m trying to meal prep more often. However for me that doesn’t look the same as many peoples traditional meal prep and I don’t plan out meals for the week. Instead that just means cooking or roasting up veggies ahead, and not always on the same day, and sometimes rice or another grain, beans, things that take longer. For this bowl that only means making the rice ahead if I want a quick meal and making the pickled watermelon radishes. In this case preparing the pickled radish in the morning while making coffee and getting the girls ready for school and cooking rice. Another time would be doing this at night for the next day. In general for other meal prep if I have a day I’m home working on things I may throw in pans of veggies or sweet potatoes in the oven so we can enjoy them in salads, buddha bowls, however we want the next few dates for breakfast, lunch, or dinner. Lately this falls on a day I’m also prepping our sourdough when we’re making it twice a week. Which is easy as well just feed in the morning and night, which takes less then 10 minutes and then the next day I make the dough while making coffee and breakfast, 3 hours later usually around lunch I shape the bread, and then 4 hours later when picking up the girls (just before or between pick-ups) I bake the bread. It’s just finding out what works for you and your schedule. Not prepping the bowl still comes together pretty quick, the longest part is the rice. You can have everything ready while the rice is cooking, even the radishes they just won’t be as strong but if you make them with the rice and they sit the 40 minutes it takes to make the rice you’re still good. As I mentioned above I’m getting ready for Expo, Natural Products Expo which is the largest food Expo! This is where brands share new products they have coming out this year. New products, flavors, ect. A chance for me to find and try all the exciting things so I can give you the details on what’s coming and what’s good! The girls also plan on attending this year but we’ll see once we get out there. I’ll be sharing a lot on Instagram Stories and my Instagram but so I don’t overload with a lot of pictures and because so much will be going on stay tuned to Stories! I, or I’ll have S, checking for questions and feedback so if you have questions about something or want more information send a message and hopefully we can get the answers. If there are things you’re curious about or are looking for (ie a new dairy free yogurt, cheese, snacks, ect) let me know below or send me a message through my blog or on Instagram. We will be flying out tomorrow and I still have a post schedule for Wednesday and next Monday but as we are also going to take a family vacation I will likely only post once next week as I want to spend time with the family and we will fly back, it’s my birthday so we’ll probably go out for dinner as we are only home for 2 days as the girls have spring break and we’ll be headed out again until the following Monday. If you’re still reading, thank you, there was a lot of information and a lot I was excited to share with you! If you’re here for the Meatless Monday link up I hope you share what’s cooking (or not cooking) in your kitchen this week below! Otherwise I hope you’re inspired by this recipe and love it as much as I do and are inspired by recipes linked up below! 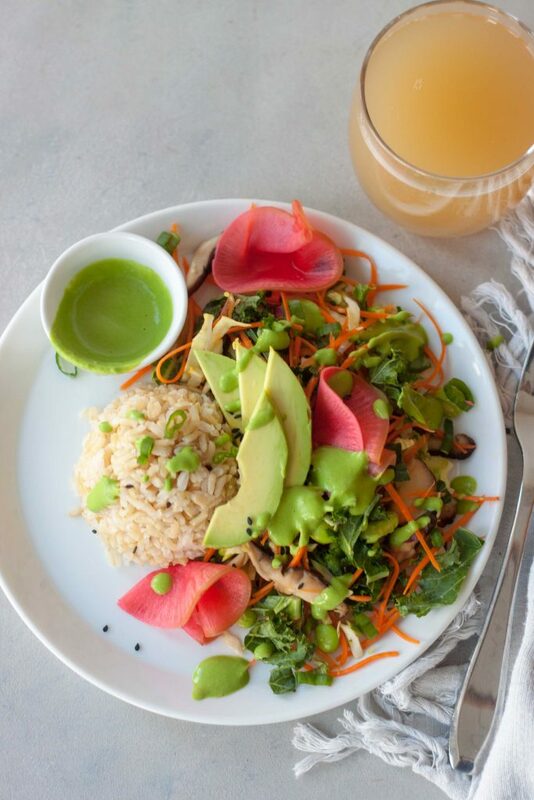 Plant Powered Asian Shroom Buddha Bowls pack a whole lot of flavor and even more nutrition. Easy to make, can be prepped ahead for a quick weeknight dinner (Meatless Monday) or lunch that has lots of plant protein, carbs, and healthy fats to fill you up and fuel your body. Plant-based, gluten free, vegan. If wanting to throw this together in minutes see notes and make rice and Pickled Watermelon Radishes ahead of time. To make Pickled Watermelon Radishes slice watermelon radishes as thin as possible, I use a mandolin. Add radishes to a quart size glass jar. In a small saucepan bring water, apple cider vinegar, maple syrup, sea salt, and garlic to a boil stirring occasionally. Remove from heat and pour over sliced radishes. Cover and refrigerate. Can be made right before making rice or made up to a week ahead. While the rice is cooking blend together spinach, horseradish, and yogurt to make the Green Horseradish Dressing. Test and add more horseradish as needed and sea salt and pepper to taste. Place in the refrigerator until ready to use. When the rice is done cooking and you are ready to let it sit for 10 minutes prepare the rest of the dish. Heat oil in skillet over medium heat. Add green onion and mushrooms. Cook 2 minutes. Add in edamame, cook for an additional 1-2 minutes. Add greens and carrots toss and cook just 1-2 minutes to wilt. Remove from heat and toss with liquid aminos. Fluff rice and place on a plate or bowl. 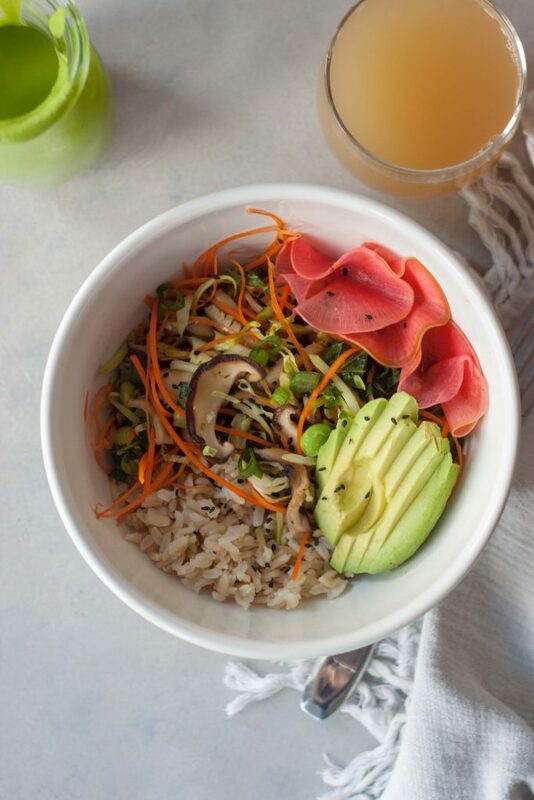 Top with mushroom and green mixture, sliced avocado, sesame seeds, and green onion. Serve with Green Horseradish Dressing. Notes: To make this a quick throw together meal in minute prepare Pickled Watermelon Radishes and rice ahead of time. This can be enjoyed with hot or cold rice. This is certainly packed with flavor and nutrition! I totally feel you on trying to picture without natural light!! I think you pictures turned out great on the plate thought!! I love how colorful these bowls are! These colors are incredible! I totally get the photography woes haha, but you made it look delicious! This looks absolutely delicious – beautiful photography!!! Adding this to my list of recipes to try ASAP! Thank you! Sometimes it’s hard to get food to look as good as it tastes. Hope you enjoy it, keep me posted!